This church is a place where people step up and show up. I’ve been so impressed with people’s commitment to support families not just in the church but outside its walls, too,” says the Rev. Sarah Person, who will be installed as the minister of the First Unitarian Universalist Society of Middleborough at 3 p.m. on Sunday, June 2. 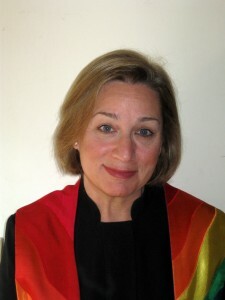 The First Unitarian Universalist Society of Middleborough joyfully announces a service to install the Rev Sarah Person, who is completing her first year of ministry with the congregation, at 3 p.m. on Sunday, June 2, in the church sanctuary at 25 South Main Street. In the Unitarian Universalist tradition, congregations call their own ministers after a yearlong search process. An installation service the following year seals the bond between the minister and the congregation, much like a wedding after an engagement. The community is invited to the hourlong service, followed by a reception in the Parish Hall. At the installation service, the sermon will be delivered by the Rev. Jan Nielsen, senior minister of the Universalist Church of West Hartford, Connecticut, where the Rev. Person served as associate minister before coming to Middleborough. The Rev. Daniel King of the First Congregation Parish in Kingston and the Rev. Christana Wille McKnight of the First Parish Church in Taunton will also participate. Music director Susan Hotchkiss and Patty Simon will perform from “Suite Antique” for flute and piano by John Rutter, and the Chalice Choir will sing the spiritual “There Is More Love Somewhere,” arranged by Clif Hardin. The First Unitarian Universalist Society of Middleborough affirms and promotes the full participation of all persons in its activities, welcoming everyone without regard to race, color, gender, physical or mental challenge, age, class, national origin or sexual orientation. Sunday services begin at 10:30 a.m. in the sanctuary at 25 South Main Street, next to the Town Hall, and church activities are held throughout each week. For more information, see www.uumiddleboro.org. I may not be free on the 2nd, but I will try attend if possible. In any case, Blessings on your ministry in Middleboro!